The Mike Harris Tories were a nightmare aberration in Ontario, the deadly enemies of the common good. Sadly many like Jim Flaherty, John Baird and Tony Clement have resurfaced in Ottawa plying their noxious trade of freeing capital from any regulation. One remembers with horror the Walkerton disaster where the failure to protect the common good in this case the water supply killed a number of people and left many with debilitating illnesses. All in the name of allowing public safety to be compromised in the name of cutting red tape and allowing corners to be cut. Another horrific example was highway safety where a particularly oafish cabinet minister allowed trucking firms to “police” themselves. Again a number of innocents killed by flying wheels. Then came a blizzard of inspections on major highways with the predictable results that over 80% of transports had serious deficiencies. The listeriosis outbreak is simply the latest example. The deadly bacteria was not caught in the workplace but in the dying. Inspectors pointed out that businesses were increasingly allowed to “police” themselves. His “3rd way” has been a disaster for the poor and a lousy model for another very flawed PM, Tony Blair. You have to love the Irish wit. Irish writer Paul Durcan wrote a poem about the new archbishop of Dublin (2003) Diarmuid Martin part of which is worth quoting. After the distinguished Irish theologian Enda McDonagh invited the highly respected but proscribed moral theologian Charles Curran to speak at a dinner honouring the former. Martin flexing his episcopal muscle banned Curran. Martin, a Vatican bureaucrat and Roman insider had been absent from Ireland for 30 years and in typical Roman fashion was imposed on the people of Dublin. On we go! Backwards! Mao Man! Archbishop Dr Martin is a Great Leader of Post-Modern Ireland. Fr Charles Curran of the USA. And promoting the creed of globalisation. 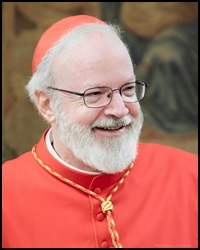 Archbishop Martin was shepherding in the shadows in Rome. Whatever you do, don’t be individualistic! God have mercy on you if I catch you being individualistic. Where you can boot away the rest of your individualistic days. Ireland and “the faithful” certainly have changed. He was reckoned a Conservative president who rejected the dropping of the A bomb on Japan but he had seen war from the inside an he despised it. Dwight Eisenhower said, “I hate war as only a soldier who has lived it can, only as one who has seen its brutality, its futility, its stupidity.” Yet the folly continues and the obtuse leaders like Bush and Harper keep sending the poor to die in lands which rightly see us as Occupiers no matter how pristine our stated intentions. “The historical Constantine is covered in blood, but it is other people’s blood. The historical Jesus is covered in blood, but it is His own blood. The crown is always covered in blood, but it is the blood of someone else. The cross is always covered in blood, but it is not other people’s blood. Constantine and Christ, crown and cross,symbolize incompatible approaches to life in thought, word and deed, as well as, two quite contradictory revelations of God and God’s will. That intrepid CBC reporter Mark Kelly reclaimed an important cultural memory for all of us.He interviewed Tommie Smith 40 years after his raising the Black Power salute in the 1968 Olympics in Mexico City. It was the fist heard round the world in that ugly summer of discontent. 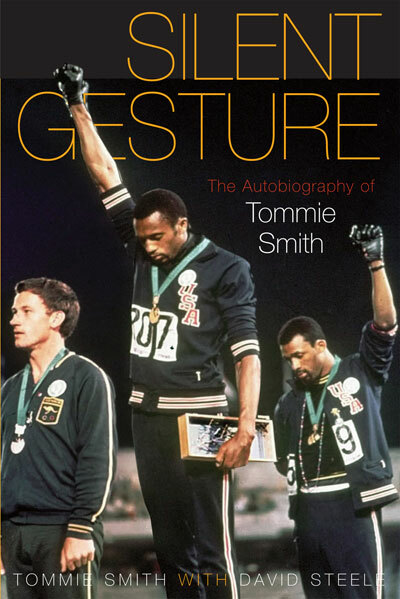 For the amnesiacs among us Smith was the first man in Olympic history to win a gold in the 200 metre race under 20 seconds.When he hit the podium he raised his gloved fist in the Black Power salute in effect ending his commercial life and enraging the rednecks in America. Smith knew what he was doing. His defiant gesture was a powerful way to make a statement about his country still reeling after the assassination of the black Moses, Dr. King. His attitude—why should he run in Mexico and crawl at home. It created howls of outrage but the brother made his pojnt and made his bed at the same time.. He and his fellow black Olympian John Carlos who also raised his fist became non persons shut out of any endorsements and subjected to almost perpetual vilification. Smith was and is an admirable man, an athlete who saw the bigger picture unlike the majority today who have no interest in becoming critical citizens but simply indulged and pampered athletes ready to cash in as individuals on their day in the Olympic sun. One thing I learned in my multi-ethnic neighbourhood was that people are people and stupid crosses all boundaries. Now I am ready for China to implode over the next 30 years of rapid economic growth. 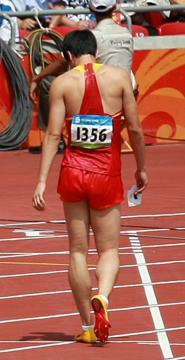 The latst proof is the national reaction Olympic athlete Liu Xiang’s pull out of the 110 metre hurdles.His sin was getting inured and letting the team (China) down. The blogsphere has it all—tears of sadness, rage,anger-and of course instant vituperation of the free market poster boy whose image keeps hectoring his fellow Chinese to get hip and drink Coke and wear Nike. Fat assed couch potatoes srtirred up by the ad culture to invest emotional and psychic energy on a pampered athlete.People paid thousands to cheer on the national hero then when he was injured they turned on him. Why should they feel so deflated? The capitalist system has well trained them to to hop on board the Vicarious Express.Get your kicks out of consumption,false gods and nationalism. Pete Seeger, where are you? Summer is always baseball season for me. I even read the box scores daily seeing who is doing what for the Red Sox.And now that Canadian Jason Bay is an integral part of the team it is even more reason to pay some attention to “the national pastime” as the Americans call it. My interest is always more than wins and losses and in fact I do not much care for the latter. I think a lot about the sociology of baseball, why it developed, the role it played in people’s lives. And today I think of Matty. 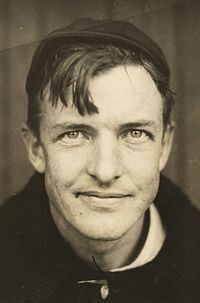 100 years ago Christy Mathewson was the most famous man in America.He single handedly took baseball from the outhouse to the penthouse. He was the hero middle America was waiting for. His arrival in New York in 1900 coincided with the rise of advertising and the growing need for heroes who measured up to “Christian ideals.” Hard to fathom now but the age of muscular Christianity was still afoot. Matty was every mother’s dream in an age when baseball was looked upon as a thug’s game. College educated, a church-going Baptist and an incandescent talent, Matty was worshipped all over America.In 16 years with the Giants he won 373 games and had 4 thirty game seasons.Handsome and a large man for his time Matty was a superb athlete, a serious reader and well liked by his team mates. In general he was venerated as a “Christian gentleman.” He is one of four athletes immortalized in the Sports Bay of the world’s largest church, St. John the Divine in New York. In this age of the juicers when heroes are in short supply, it’s nice to think of a man who lived a century ago who embodied integrity and decency. I believe one of the reasons people get emotional about Mathewson is his tragic end. He went over in 1918 to WW l and was gassed in a training exercise. He died in 1925 at age 45 because of complications. ”I took no pride or pleasure then, nor do I take any now, in the brutality of war, whether suffered by my people or those of another nation,” Charles Sweeney wrote. ”Every life is precious. But I felt no remorse or guilt that I had bombed the city where I stood.”To the end Sweeney vigorously defended his actions and the US decision to drop the second bomb on Nagasaki. He ridiculed all who questioned the decision. Contrast Sweeney’s defensive reaction with George Zabelka the Catholic chaplain who never ceased apologizing for this heinous act which mass murdered so many and ushered in the nuclear age. The fact that forty-five thousand human beings were killed by one bomb over Nagasaki was new only to the extent that it was one bomb that did it. To fail to speak to the utter moral corruption of the mass destruction of civilians was to fail as a Christian and a priest as I see it. Hiroshima and Nagasaki happened in and to a world and a Christian Church that had asked for it-that had prepared the moral consciousness of humanity to do and to justify the unthinkable. 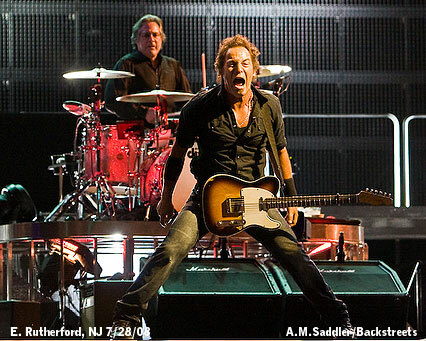 Bruce Springsteen has internalized the Catholic sacramental vision. As a kid in a New Jersey Catholic grade school and with plenty of opportunities to grasp the idea of invisibilia per visibilia, Bruce apprehended the power of the Incomprehensible Mystery—midnight mass, stained glass windows and the choir singing with joy. Above all a Sacred Story second to none. He intuited the unseen Holy showing up in the visible world, the divine in the mundane, the transcendent in the immanent. Try friendships, laughter, sunsets, Mozart and babies for starters. On this train there is room for “saints and sinners, losers and winners, lost souls “etc. Looks like the church of the big tent to us. From all angles Boston’s Archbishop seems to be a quick learner—a nice change from the pompous Cardinal Law who flew a little too close to the sun and GW Bush. Law loved the trappings of power and all that came with them. The Franciscan O’Malley clearly is uncomfortable with them. Acts like a Franciscan selling off his mansion and generally mirroring an authentic clerical lifestyle. But there is one area he appears quite dumb and that is in his understanding of politics. Apparently O’Malley cannot understand how RCs can vote Democrat! Wow. So that leaves the war party and the bash the poor party as the only choice. No party approximates God’s reign and the Democratic Party sure has lost its link with the poor and working class. 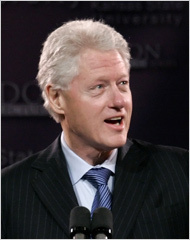 Blame 3rd Way Billy Clinton for that. The Dems indeed are pathetic and Nancy Pelosi as House Leader is an embarrassment. The only authentic Democratic voice (besides Ted Kennedy) still in touch with ordinary people at the national level has been Dennis Kucinich who wants to impeach the hapless Bush. But the Republicans as vehicles of the Gospel! Madonna mia!